Be the first to share your favorite memory, photo or story of Margo . This memorial page is dedicated for family, friends and future generations to celebrate the life of their loved one. 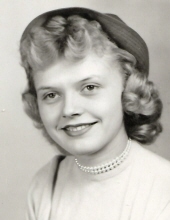 Margo C. Seversen – Age 80, beloved wife of Russell P. Seversen died Saturday April 6th at the Lowell General Hospital with her family by her side. She was born in the Bronx, NY, February 21st 1939, a daughter of the late William and Thea (Scharzwald) Meyer and lived in Connecticut and Bedford before moving to Billerica 46 years ago. Margo was a volunteer hospice care provider for many years and most recently worked for Right at Home as a home health care provider in the area. Besides her husband, Margo is survived by her daughters, Karin Seversen of Derry, NH and Wendy Mercurio and her husband William Mercurio of Wakefield; her brother, William Meyer of NY and three grandchildren, Paul Bonnell and Nicole and Matthew Mercurio. SEVERSEN – Of Billerica , April 6, Margo C. (Meyer) Seversen. Funeral Wednesday from the SWEENEY MEMORIAL FUNERAL HOME, 66 Concord Rd. , Billerica at 10 a.m. A graveside service will be held at Fox Hill Cemetery, 130 Andover Rd. , Billerica at 11 a.m. Relatives and friends respectfully invited. Visiting hours will be held Tuesday from 4-7 p.m. Memorial contributions may be made to St. Jude Children’s Research Hospital , 501 St. Jude Place , Memphis , TN 38105 . "Email Address" would like to share the life celebration of Margo C. Seversen. Click on the "link" to go to share a favorite memory or leave a condolence message for the family.